If you just purchased or received a St Benedict Medal and would like your priest to bless your Saint Benedict medal, be sure to have your priest use the traditional blessing below. Need, we say have it done in Latin, if possible? Nevertheless, we’ve included the English in case that’s the only option you have. In the name of God the Father + who made heaven and earth, the seas and all that is in them, I exorcise this medal against the power and attacks of the evil one. 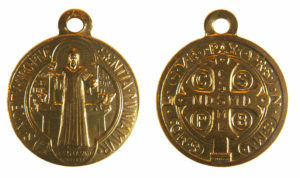 May all who use this medal devoutly be blessed with health of soul and body. In the name of the Father + almighty, of the Son + Jesus Christ our lord, and of the Holy + Spirit the Paraclete, and in the love of the same Lord Jesus Christ who will come on the last day to judge the living and the dead, and the world by fire. Amen. 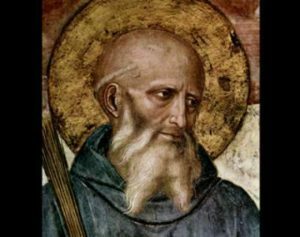 Let us pray: Almighty God, the boundless source of all good things, we humbly ask that, through the intercession of St. Benedict, you pour out your blessings + upon this medal. May those who use it devoutly and earnestly strive to perform good works, be blessed by you with health of soul and body, the grace of a holy life, and remission of the temporal punishment due to sin. May they also with the help of your merciful love, resist the temptation of the evil one and strive to exercise true charity and justice toward all, so that one day they may appear sinless and holy in you sight. This we ask through Christ our Lord. Amen. The medal is then sprinkled with holy water. If you buy through any of the site links, Beauty So Ancient may get a commission. Thanks for supporting BeautySoAncient.com.